Antibiotics are chemicals that have the ability to inhibit the growth of microorganisms, especially bacteria, and are either produced naturally by other microorganisms or synthetically in a laboratory. Although antibiotics are commonly prescribed for 7 to 14 days to treat most illnesses, long-term use may be necessary to treat certain chronic infections. 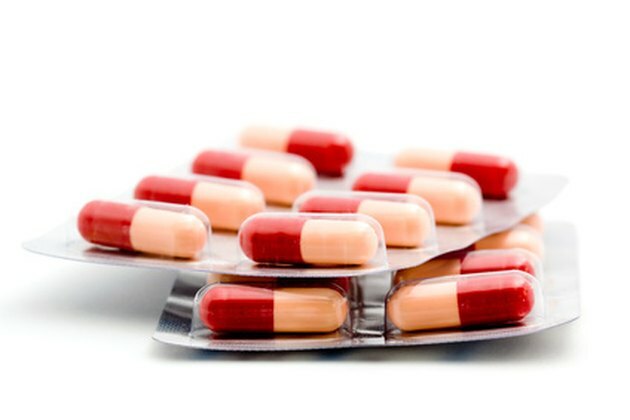 Prolonged use of antibiotics can have several side effects, so it is important for both the doctor and patient to weigh the pros and cons of prolonged antibiotic use. Antibiotic resistance is the inability of the antibiotic to inhibit the growth of certain bacteria, thereby making it useless to treat infections caused by that particular bacteria. Development of antibiotic-resistant bacteria is possibly the most serious side effect of long-term antibiotic use. According to an article published in the August 2009 edition of the "Journal of American Medical Association," bacteria such as Staphylococcus aureus, Streptococcus pyogenes and Mycobacterium tuberculosis are developing resistance against antibiotics, and as a result common infections are becoming more difficult to treat, patients are requiring extended hospital stays and the spread of these resistant bacteria is threatening communities. However, a study published the January 2008 edition of "Pharmacoepidemiology and Drug Safety" states that long-term use of amoxicillin, ciprofloxacin and doxycycline appears safe without increased adverse reactions. But these antibiotics are not useful in treating all types of infections. Several surface tissues, such as skin and mucous membrane, as well as certain internal organs such as the intestines, are colonized with large amounts of microorganisms, predominantly bacteria and yeasts. These microorganisms are part of the normal flora. However, excessive and prolonged use of antibiotics, especially broad spectrum antibiotics which act against several different types of bacteria, can lead to eradication of the normal flora from their habitats. According to Todar's Online Textbook of Bacteriology, lack of normal flora could lead to vitamin deficiencies, especially vitamin K and vitamin B12. It can also suppress the natural immunity of the body, making the individual more susceptible to infectious diseases. The decrease in the population of beneficial bacteria can also lead to overgrowth of unwanted microorganisms such as Candida, and can lead to conditions like oral thrush and Candida vaginosis. Both long-term and short-term use of antibiotics can lead to several changes in the body. Although most allergic reactions such as skin rash and swelling of the face appear within first 48 hours of the antibiotic use, other changes--such as lack of appetite, nausea and mild diarrhea--can last for a long time, so prolonged use of antibiotics can be very distressing to the patient. What Is the Difference Between Penicillin & Amoxicillin? What Are the Treatments for Mycoplasma Infections?